What Has America Gained from Obama's Taliban Concessions? In the previous presidential debates that have touched on foreign policy, Barack Obama and Joe Biden have touted their administration’s approach to the war in Afghanistan as a success, with little protest from Republican challengers Mitt Romney and Paul Ryan. But a closer look at the results of Obama’s Afghanistan policy, both practically and morally, reveal a real weakness in the administration’s record that, thanks to a complicit press, has not been properly presented to the American people. The human costs of the war are increasing; more troops have been killed or wounded in Obama’s one term than in George Bush’s two. The families of killed servicemembers have called out the administration for its nonsensical rules of engagement which needlessly endanger soldiers. A staff sergeant who was later KIA warned that the Commander-in-Chief’s aimless strategy was achieving the same result. But beneath the policies themselves — which, to reiterate, have objectively increased the number of troop deaths — lays an ideological shift in America’s approach to the fight. On the one hand, the Taliban and its affiliate Al-Qaeda are the entities we are physically fighting. But on a philosophical level, the Obama administration has softened in its resolve against the Taliban. We have legitimized the Taliban and its world view by negotiating with — and making concessions to — this Islamist organization. Following the 9/11/2001 attacks, the western world took a close look at this ideology; for many, it was the first time ever. And what the average American found was an ideology hostile to women, to minorities, to those of different faiths or no faith. The Taliban ran a socio-political order centered around that most fundamental strain of political Islam and enforced it with violence — in effect, institutionalized terrorism. For all his detractors, President George W. Bush established a clear stance against the Taliban and its aid of Al-Qaeda. To the Bush administration, this political group did not have the moral authority to demand a give-and-take negotiation process. They were an enemy both to the American and Afghan people, in the view of the U.S. government, and they would be treated unequivocally as such. Therefore, the President made ultimatums, not concessions. Since then, the Taliban has not changed. It has not softened with a newfound respect for America, now represented by President Barack Obama. It has not ceased but has increased its violence toward Americans, most notably through “green on blue” attacks wherein operatives posing as trainees in the Afghan security forces take advantage of their proximity to coalition troops and murder them. It has not ceased its oppression of women, as seen in the case of Malala Yousafzai, a Pakistani teenage girl shot in the head by a Taliban gunman for asserting her right to an education. The only thing that has changed is the United States’ stance toward the Taliban. Call it an embrace, call it appeasement, it is an absolute disaster. There is no coherence to the Obama administration’s Afghanistan policy. On the one hand, this Islamist entity is still an enemy which U.S. soldiers fight both on the ground and through drone strikes. At the same time, however, the Taliban has been effectively placed on an equal moral plane with the United States, to the point where our government is negotiating and making concessions to it. In fact, this reliance on negotiation instead of overwhelming force gives the Taliban the ability to cease negotiations over hypocritical grievances, such as a shooting spree by a rogue U.S. soldier — a tragedy dwarfed by the Taliban’s own systematic murder of civilians. Taliban leaders are setting the terms of the U.S. presence in Afghanistan after the projected 2014 troop withdrawal. They have negotiated prisoner exchanges with outcomes 5-1 in their favor. Secretary of State Hillary Clinton has legitimized the group and its role in the future of Afghanistan. U.S. troops are even prohibited from “verbal disrespect” of the Quran after an incident where militant prisoners were caught passing messages through Qurans and, when they were disposed of, local workers accidentally burned the books. In response, Afghan Islamists protested violently, killing at least six U.S. servicemen. And the Obama Cabinet’s response was not to demand justice from Taliban leaders behind those killings, it was to prostrate American troops further in deference to Islamic fundamentalism. 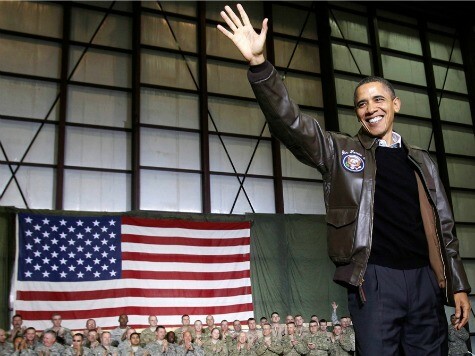 In the very speech Obama gave after jetting to Bagram Air Base to announce a 2014 troop withdrawal agreement, President Obama admitted that negotiations with the Taliban could “be a part of this future.” If the same Taliban that ruled the country in 2001 is now being treated as a ruling entity upon America’s exit, then nothing has changed, save for the loss of thousands of American lives. The thought process behind the worsening situation in Afghanistan can also be seen in the deadly terrorist attack in Benghazi, Libya on 9/11/2012. According to intelligence officials, the Obama administration’s guiding principle is to keep a “low profile” in the Middle East, which couldn’t be more naïve. You can’t fight a war, keep a “low profile,” and still expect to win. Wars are won by superior force and resolve, not by goodwill from one’s enemies. The question for Romney, Ryan, and the average American, then, is what the United States hopes to achieve from this self-contradiction. Attempting to simultaneously be a hawk and a dove, what is Obama’s ultimate vision for the Middle East? Is it a Taliban marginalized and weakened, made ideological pariahs as Nazis were by the second World War? Certainly not. But even ignoring the fate of the Middle East, what’s in it for America? What are we getting for our concessions to the Taliban? What do we gain by appearing weak — elevating a backwards, misogynistic world view to equal footing with our own nation? The President has no answer, as he has no coherent vision for America’s interests. And every citizen should know this as they prepare to vote in the coming weeks.